A new study commissioned by Radiocentre has found that commercial radio supports £683m in gross value added (GVA) to the UK economy. The report prepared by Oxford Economics, the market leader in providing economic impact assessments, brings together a range of information for the first time in order to assess the economic contribution of commercial radio and the value it provides. ‘Commercial radio’s popularity with listeners is not in doubt with an incredible weekly audience of 34.3 million. However the economic activity it supports has never been examined in any detail. We thought it was about time to address this and gather comprehensive data on the value of commercial radio to the economy, advertisers and the music industry. 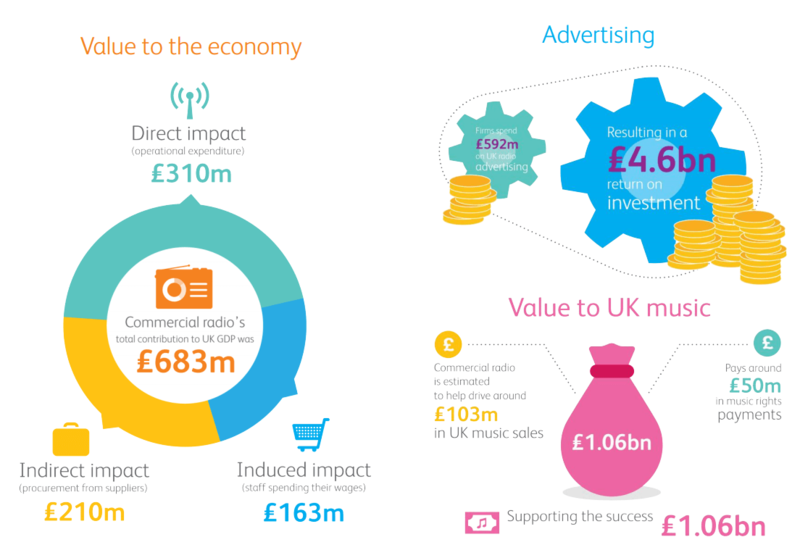 ‘It is hugely impressive to see the positive impact commercial radio has on the UK economy. Like many of our creative industries it makes a notable contribution to our GDP and employment. It also supports other sectors indirectly and is a fantastic promotional platform for the UK music industry. A summary report, entitled ‘Valuing Radio’, is available here. The key infographics from ‘Valuing Radio’ are below.